On your mark … get set … go for all new fast and furious entertainment in Awesome Adventures: Races, Chases & Fun, racing onto DVD, Digital Download and On Demand June 12, 2012 from Lionsgate and HIT Entertainment. Zoom into action-packed fun with six rip-roaring adventures featuring preschool favorites Thomas & Friends™, Fireman Sam™ and Bob the Builder™. Always driving home lessons in friendship, loyalty, responsibility and teamwork, this trio takes the checkered flag every time! Racing engines, run-away go-carts, and monster chases lead to thrills, spills and rescues! Thomas and Hiro discover there’s no need for speed when trying to be a Really Useful Engine; Fireman Sam is rescue-ready when Norman and James forget to put safety first; Bob the Builder’s Machine Team keep their eyes open to big adventure and big fun, putting the TEAM in teamwork and getting the job done. Get set and go with your favorite, fast friends in these six exciting adventures! I love that this DVD has all of my son's favorite characters in one place! 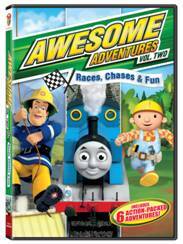 When I saw that Thomas, Fireman Sam, and Bob the Builder were all characters in this one DVD, I knew it would be awesome and it WAS! If your child loves these characters, get them all in one place in this fun Awesome Adventures: Races, Chases & Fun! I'm stopping by to visit/ follow from the Welcome Wednesday hop. We are riding the wave of life at localsugarhawaii.com and I would love it if you joined us for the ride. I would love it too if you joined us for a simple wordless Wednesday link up. No rules. Just friends. I would love for other beautiful bloggers to discover the good that you do.